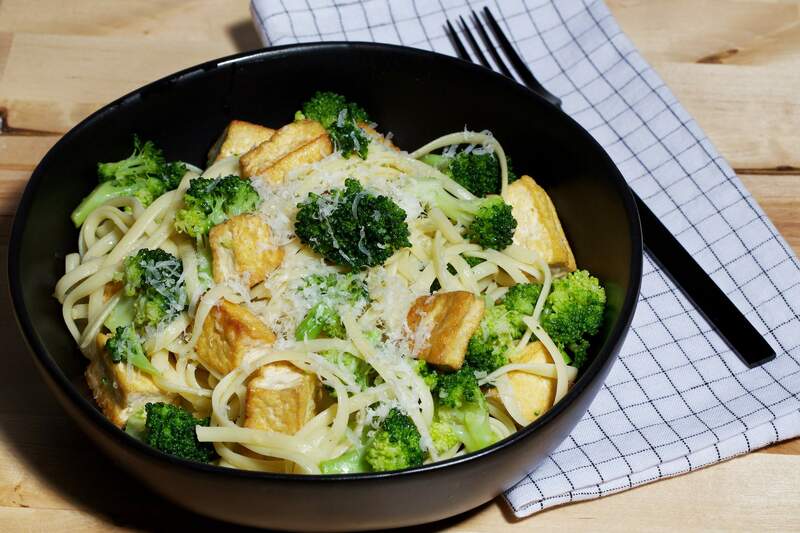 Linguine with Broccoli and Tofu. Tofu, often perceived as tasteless and weird in Western cuisine, can be spiced up and incorporated into many of your favorite dishes. Stacked Deli Sandwiches With Seared Tofu. Here’s the trouble with tofu, at least to some Western eaters: You can’t dip it in nacho cheese sauce. Even as people have become accustomed to the idea of drinking soy milk lattes, the idea of eating tofu – which is, after all, just coagulated soy milk – can be a non-starter for many who see it as a weirdo ingredient limited to vegans or championed by Hippies Without Tastebuds. In Western cuisine, tofu is not only viewed with skepticism, it tends to be practically nonexistent in our culinary repertoire. Rebranding it as “bean curd” hasn’t really helped its cause, either. For some, the ick factor surrounding tofu is almost equivalent to their aversion to edible insects, despite the fact that many cultures around the world happily devour both as reliable sources of protein. But once we look at tofu as a protein that can be married with many other kinds of “typical” American ingredients, including cheese, eggs and, yes, bacon, then there is no excuse not to give tofu pride of place on the plate. Growing up, my consumption of tofu generally came in the form of small bits floating in a bowl of hot-and-sour soup at the local Chinese restaurant, or glorious deep-fried puffs made by my friend Caroline’s Vietnamese mother after school, which we dunked, scalding hot, in fish sauce. For many years, I thought of tofu only as an Asian ingredient, rather than just another protein source that could be a part of my everyday kitchen, no matter what cuisine was on the menu. That is, until I came across a pasta recipe in the classic cookbook From a Monastery Kitchen that incorporated tofu and Parmesan. I can honestly say that it had never actually occurred to me to pair tofu with cheese; like seafood, it seems to be accepted that they just don’t belong on the same plate. But, surprisingly, it turns out that the simple act of adding a sprinkling of freshly grated Parmesan to enhance tofu’s subtle nuttiness can be a real game-changer, even for avowed tofu-haters. Over the years, my updated version of that recipe, Linguine with Broccoli and Tofu, has become a favorite of my vegetarian family – and my omnivore friends love it, too. For those who want to increase their intake of healthy, plant-based proteins without necessarily giving up eggs, cheese and meat, creatively combining tofu with more familiar ingredients can be a painless, and tasty, way to take a more flexitarian approach. Extra-firm tofu can be easily crumbled into ground beef for hamburgers or thinly sliced and layered with Gruyere for a new take on a croque monsieur. Some might say it’s the cheese or meat that makes the tofu bearable, but – why not? For Dragonwagon, that might mean blending firm tofu with Neufchatel cheese for a creamy enchilada filling, or layering it with eggy crepes. The trick is in understanding that all tofu is not created equal. “Different kinds of tofu are as different as different cuts of meat,” Dragonwagon says. Waterpacked firm tofu can be a marvel of versatility, whether marinated, grilled, baked, fried or pureed. Because tofu is naturally mild, it takes well to marinades and is easily reimagined in dishes traditionally made with chicken or even pork. Cut firm tofu into wedges and soak in tangy buttermilk before flouring, frying and slathering in a spicy buffalo wing sauce, served with a creamy dill-flecked blue cheese dressing on the side. Marinate slices in Tabasco-and-honey-spiked soy sauce, then broil and top with a poached egg for Sunday brunch. Toss chilled tofu cubes with lemon juice and cracked black pepper to accompany bacon, hard-boiled eggs and avocado in a twist on a traditional Cobb salad. Silken tofu, the shelf-stable product found in aseptic packaging, is the perfect base for a rich chocolate mousse or savory egg-free mayonnaise. It is easily adapted for use in cheesecake and pudding recipes, providing a lighter take on creamy desserts that can be a godsend for anyone with a sweet tooth who wants to have their cake, and eat it, too – but with fewer calories, less fat and more protein. It’s no surprise, then, that one of the most popular recipes on Sunrise Soya’s website is Tofu Parmigiana, a reimagining of the classic chicken-based dish in which slices of extra-firm tofu are marinated overnight in pesto, dipped in an egg batter and coated with seasoned bread crumbs before being fried, then baked with tomato sauce and Parmesan. 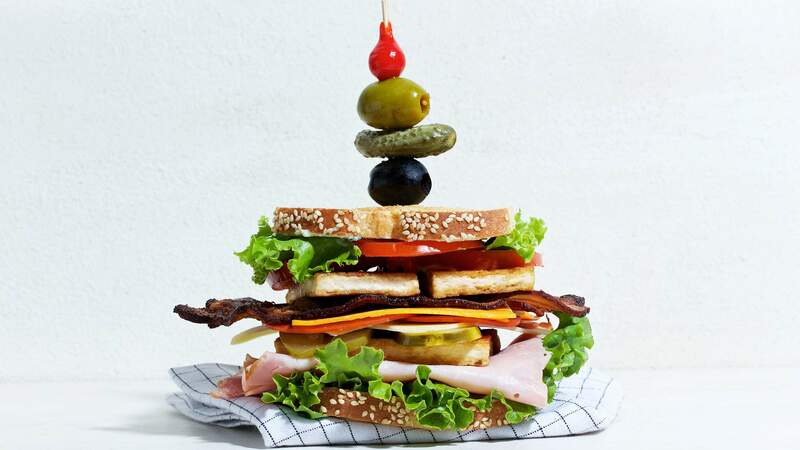 So pile that tofu high, Dagwood-style, onto your favorite deli sandwich. Wrap it in bacon, as the Japanese do, or whip it into a rummy piña colada. Splash it with Sriracha, coat it in cheddar, barbecue it on a bun. As for dipping it in nacho cheese sauce? Don’t mind if I do. Tofu and cheese in the same dish – imagine that! This is a nice, low-key way to introduce people to tofu, especially because the addition of Parmigiano-Reggiano brings out tofu’s natural nuttiness.To make the dish vegan, use toasted panko bread crumbs tossed with a little salt instead of the Parm.Ingredients:One 1-pound block extra-firm tofu1 large head broccoliSalt, as needed1 pound dried linguine½ cup olive oil3 cloves garlic, mincedFreshly ground black pepper, as needed¾ cup freshly grated Parmigiano-Reggiano cheeseMethod:Drain the tofu and pat dry with several paper towels, pressing down lightly to help remove excess water, then cut into ½-inch cubes. Trim the broccoli by removing the thickest part of the stem, then cut the thin stems and florets into bite-size pieces. Bring a pot of water to a boil over high heat. Add a generous pinch or two of salt and the pasta; cook for about 6 minutes. Add the broccoli pieces to the pot (along with the pasta); cook for about 3 additional minutes, or until the pasta is al dente and the broccoli is bright green and just tender. Drain and then rinse the pasta and broccoli right away with cool water. Drain well. Heat half the oil in the same pot you used to cook the linguine and broccoli, over medium-high heat. Once the oil shimmers, add the cubed tofu and stir to coat. Cook for a few minutes, stirring frequently, until it is golden brown and lightly crisped all over. Reduce the heat to medium, then return the drained pasta and broccoli to the pot, along with the remaining ¼ cup of oil and the minced garlic. Toss for a few minutes until all the ingredients are well incorporated and warmed through. Taste and season with salt and pepper, as needed. Serve right away, topping each portion with up to 2 heaping tablespoons of the Parm. Source: Adapted from From A Monastery Kitchen, by Brother Victor-Antoine d’Avila-Latourrette (Harper & Row, 1976). This savory spread is a perfect addition to sandwiches and burgers, as a dipping sauce for raw vegetables or even a creamy sauce for a cold pasta salad. You can also change the flavor by substituting a mix of cilantro and basil for the herbs and lime instead of lemon juice, spice it up with jalapeños or Thai chile peppers, and use roasted garlic in place of fresh. 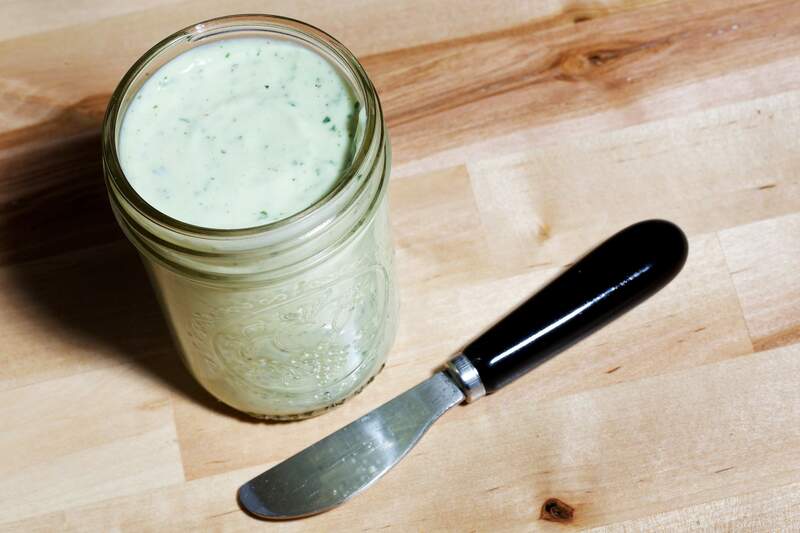 Make Ahead: The mayo can be refrigerated for up to 4 days. It will thicken and release moisture over time; drain off any liquid before using. Ingredients:One 1-pound block silken soft tofu (reduced fat optional)1 tablespoon extra-virgin olive oil1 teaspoon Dijon mustardJuice of 1 lemon (about 3 tablespoons)2 cloves garlic¼ cup fresh basil leaves2 teaspoons fresh rosemary leaves2 teaspoons fresh tarragon leaves (from about 2 sprigs)¼ cup flat-leaf parsley leavesSaltFreshly ground black pepperMethod:Combine the silken tofu, oil, mustard, lemon juice, garlic, basil, rosemary, tarragon and parsley in a food processor; puree until very smooth. Taste, and season with salt and pepper, as needed. Nutrition: Per 2-tablespoon serving: 20 calories, 1 g protein, 0 g carbohydrates, 2 fat, 0g saturated fat, 0 mg cholesterol, 20 mg sodium, 0 g dietary fiber, 0 g sugar. Source: Adapted from Passionate Vegetarian, by Crescent Dragonwagon (Workman Publishing, 2002). If you love a mile-high stacked sandwich, then tofu is a perfect addition to layer with veggies and, yes, even your favorite meat and cheese.Sear extra-firm tofu that has been coated lightly with liquid aminos (a blend of amino acids and plant proteins) for a punch of umami; you can also treat the slices with pesto, Buffalo sauce, or your favorite marinade or dry rub before cooking to add extra flavor. How you choose to layer the ingredients is all about you - there are no rules.Ingredients:For the tofu:One 1-pound block of extra-firm tofu, well-drained and patted dryLiquid aminos, such as Bragg Liquid Aminos (typically available as a spray)2 teaspoons vegetable or canola oilFor the sandwiches:4 slices of sandwich bread of your choice, lightly toasted4 tablespoons Herbed Tofu Mayonnaise (see related recipe)Several leaves of green leaf lettuce4 ounces sliced ham1 to 2 dill pickles, sliced lengthwise into strips4 ounces sliced salami or pepperoni4 ounces sliced cheese (such as Swiss, cheddar or muenster, or a combination)2 tomatoes, sliced4 strips bacon, cooked until crisp, then drainedMethod:For the tofu: Cut the tofu into 8 slices, about ½-inch each. Pat each slice dry, as needed. Coat each side with the liquid aminos. Heat half the oil in a nonstick skillet over medium-high heat. Once the oil starts to shimmer, add 4 slices of the tofu; cook for 5 minutes or until golden brown and lightly crisp, then turn them over and cook for 5 minutes on the second sides. Transfer to a plate to cool; repeat with the remaining oil and the rest of the tofu slices. For the sandwiches: Lay out 4 slices of the toasted bread and spread each with 1 tablespoon of the Herbed Tofu Mayonnaise. Place a lettuce leaf on 2 of the pieces of toast, then add alternating slices of tofu, ham, pickles, salami, cheese, tomatoes and bacon. Top each with another lettuce leaf and finish with the remaining slices of toasted bread. Serve right away. Source: From Washington food writer Kristen Hartke.